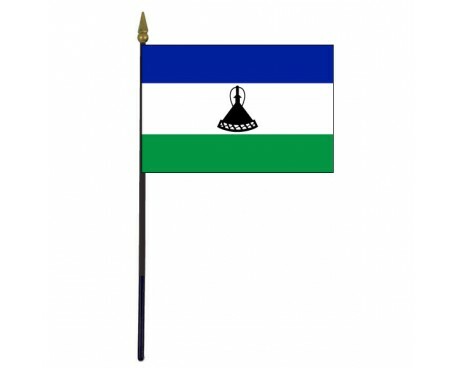 The flag of Lesotho is one of the youngest flags in Africa. 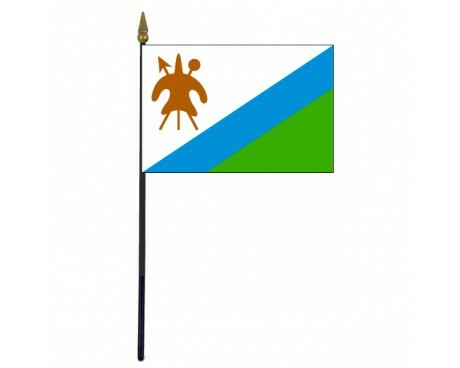 It follows in the footsteps of both the colonial flags that represented Lesotho while it was part of the British Empire and the two flags that have represented the country after its independence. The Lesotho flag is a horizontal tricolor of blue, white, and green. A black depiction of a traditional mokorotlo has is in the center of the white stripe. The hat is a traditional piece of clothing from the region, so it serves as a symbol of the nation's traditional culture and ethnic heritage. The blue stripe that runs along the top of the flag represents the sky and the rain that falls from it, while the green stripe is a symbol of prosperity. 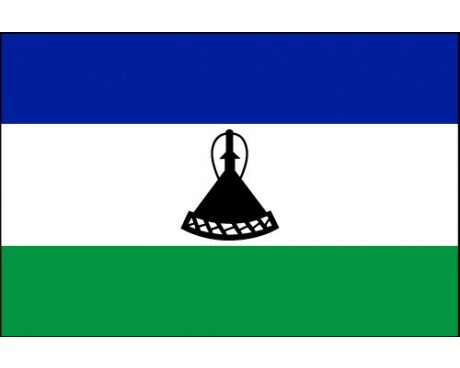 The white stripe represents peace, which was considered the most important virtue that had to be represented on the flag of Lesotho when it was adopted. The first Lesotho flag came into use in 1884, although it did not receive official approval at the time. It was a British colonial flag, and it followed the same pattern as most of the other flags within the Empire. It was a British blue ensign that displayed the Union Jack in the canton and the colonial seal of Lesotho in the fly. The details of the seal changed in 1951, but the colonial pattern would not fall out of use until 1966. Lesotho adopted its first flag as an independent nation in 1966. It features blue field with a stripe of green along the hoist and a stripe of red next to the green stripe. It displayed a white mokorotlo hat inside the blue field. The government of Lesotho changed hands in 1987, and that changed heralded the adoption of a new flag. The new flag featured brown spears crossed behind a shield in the flag's canton and a field that was divided diagonally between white and a section of blue and green. That flag fell out of use in 2006 when it was replaced by the modern flag as part of the nation's celebrations for the 40th anniversary of its independence.